August 26, 2014, 8:39 PM · There is a huge difference between a theme park and an amusement park. The former is designed to make you lose your sense of the real world, while the latter specializes in helping you lose your lunch! Both have merit and a place in the broader spectrum of the theme park world and serve to flesh out the experiences available to both thrill seekers and immersion lovers alike. Last year (2013) the Rao Family made the trek to one of the best theme parks on the planet, Disneyland, so it was only fitting that this year (2014), we would journey to one of the best amusement parks on the planet, Cedar Point, where we would be immersed in a little more testosterone and a lot less story. And since my youngest duckling finally reached the coveted height of 54”, I actually felt like it was my duty as a father to plan a visit to the “Roller Coast”. While I was planning this excursion, I thought that because we were headed to the great state of Ohio to visit the self-proclaimed, “greatest amusement park in the world,” why not plan a stop at its nearby sister park, Kings Island, also in Ohio, to visit B&M’s latest coaster masterpiece, Banshee, as well? Why not, indeed? For those who don't know me, some introductions are in order! I am a “humble” project leader (started as a programmer years ago) working at one of the top employers in Kansas City. Originally born in Southern California, I cut my teeth on parks like Disneyland, Knott's Berry Farm, Magic Mountain, and Marriott’s, yes, Marriott’s Great America. In my early teens, my family moved to the East Coast to Annandale, Virginia, where Busch Gardens and Kings Dominion became my stomping grounds. Finally we moved to Missouri at a time when Worlds of Fun was not owned by Cedar Fair and still had wonderful attractions like the Orient Express and the Zambezi Zinger. I miss those days especially now that Worlds of Fun is so diminished and my adopted home park, Silver Dollar City, is four hours away in Branson, Missouri. I am 45 years old as of this writing, but will turn 46 at the end of the month (“It's not the years, it's the mileage”). My wife, Robin, just turned 29 for the twentieth time a few days ago. She is a mom, a microbiologist (one weekend a month), and a teacher as she has successfully homeschooled all three of my kids, Jacob (16), Jeremy (14), and Emma (11) for a number of years. For this trip we wanted to make sure everyone had a ride buddy, so we invited a family friend, Joanna (13), to ride side by side with my little princess, Emma. Being a solo rider ain't all it's cracked up to be. Besides, with the kids otherwise occupied mom and dad can make googly eyes at each other at all the coaster photo ops! Our second step was to hit up Theme Park Insider regulars Derek Potter (Kings Island) and James Koehl (Cedar Point) for their opinions and expertise. These two gentlemen provided a plethora of great info, tips, and tricks for maximizing our visit to these two coaster meccas. With the assistance of these two gurus, I developed a couple of touring plans not unlike what I would build for a Disney or Universal park, just filled with a lot more machismo! So, I cannot proceed further in this diatribe without thanking Jim and Derek. You guys rock! It is nice to have some kindred thrill seekers just an email away! …which gets us up to the present day. It is now August 10th, the 23rd anniversary of my marriage to Robin, and we are in my 2006 Toyota Sienna (“The Family Truckster”) about six hours away from Mason, Ohio, and Kings Island. Today is supposed to be just a travel day since we won’t get to our hotel until about 7 or 8 PM, but you never know. Kings Island is open until 10 PM tonight, so maybe we can get a couple hours of fun in before the main visit tomorrow? If not, we’ll eat dinner, swim, then pray the predicted thunderstorms blow past during the night, while we shuffle off to sleep. Kings Island opens at 10:00 AM tomorrow, but Early Ride Time for Gold and Platinum Pass Holders starts at 9:30, so we’ll be at the park by 9:00 AM sharp. 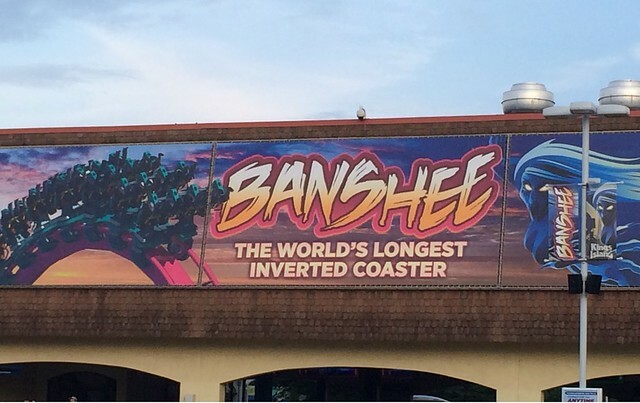 I cannot wait to ride Banshee! 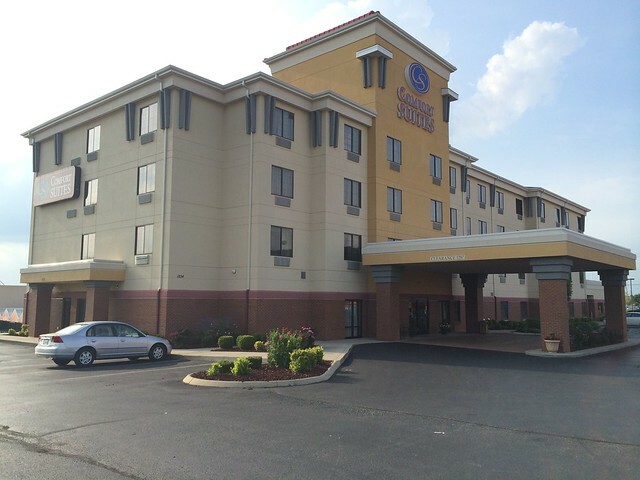 After some major stop and go traffic in Brazil, Indiana, we finally made it to the Comfort Suites in Forest Park, about 20 minutes away from Kings Island, but just a few minutes from Pappadeaux’s Seafood Kitchen. Yum. Maybe we should go get some dinner? This Comfort Suites offers a good sized room with two queen beds and a queen sized pull out couch. Plenty of room for the six of us, though with one bathroom we’ll have to coordinate morning festivities. The indoor pool is decent, but over chlorinated and a bit cloudy. We might swim tomorrow night if things get cleaned up. The fitness room is decent sized for a Comfort Suites with a good collection of equipment including not one but two treadmills. Overall the hotel is nicely appointed and tended, with new carpet and good smells throughout. For $110 a night and free breakfast, I think it will be a good two night stay. Tonight, though, I decide at the last minute that we will unpack, eat a quick dinner, and head to the park before the rains hit. If we can knock out a few coasters ahead of Monday our touring plan just gets that much easier. So, we’ll eat at a nearby Panera (sorry Pappadeaux’s), then bolt to the park. More later…. Upon arriving at Kings Island the first thing that struck me is the fact that this park is huge. And it is in your face. Big-boy rides dominate the horizon, sweeping into the sky like a downtown cityscape. If you are a height-challenged person, you might be better to just move along. Thrill seekers only, please! We quickly parked and fast walked into the main entrance, snapping photos of Banshee signage along the way. We hardly had time to enjoy the impressive “Main Street”-esque entrance as we sped with single minded, OCD purpose toward Action Zone and Banshee! What a photogenic coaster! Banshee is simply breathtaking from every angle. B&M made art with this bad boy, art, I tell you! Skipping with Coaster Boy glee, we hopped into the rapidly moving line and made it to the load house in about five minutes. In wonderful Disney fashion an employee (cast member?) was directing folks to the various lines. Side note here: one thing Kings Island does, that I really like, is control the loading areas. At Worlds of Fun, guests just cram into the load house like sardines, making for an incredibly uncomfortable and often swelteringly hot experience. Not at Kings Island. Here, employees either direct folks to given rows, or at least hold them back until the load area clears a bit then releases a small number to select a queue. I love the organization and commitment to a good customer experience. Anyway, we were directed to a couple of middle rows and quickly boarded. There was an excitement, a buzz in the area, with guests jubilantly exiting the ride and enthusiastically boarding. We could tell Kings Island had a winner on their hands with Banshee just by the broad smiles from riders and workers alike. The environment was sizzling! Amid hoots and hollers the train rolled out of the station ascending the lift hill with relentless abandon, and then, without the traditional B&M kicker, plunged into the oh-so-amazing course. So fast. So smooth. So upside down! My goodness, what a wonderful coaster. Just a tremendous ride filled with acceleration, force, and dizzying twists, turns, and inversions. One brilliantly executed element after another. And that oh-so-slow final corkscrew…wow! Banshee does not disappoint. In fact, it alone was worth the 10-hour drive. Returning to the station shouting exaltations to the ride ops, we quickly plunged out the exit, through the gift shop, and immediately got back in line. The second ride was just as brilliant as the first. I do not know how B&M can produce a better inverted coaster. Excellent. Storms had been forecasted all day, and clouds were threatening, so despite a strong desire to ride Banshee for a third time we moved off to Diamondback. Sadly, only two trains were in operation and the line was fairly long. We ended up waiting about 30 minutes, while the clouds got thicker and blacker, and the night got darker and more forbidding [note: that 30 minute wait ended up being our longest wait at Kings Island]. For my first ride I grabbed a wing seat on the left hand side in the middle of the coaster. Diamondback is smooth and powerful, and a very fine ride. The turnaround is excellent. Sadly, I think the ride loses a little bit of steam on the comeback, but it is still well above average. It compares favorably to Apollo’s Chariot at Busch Gardens Williamsburg but is not quite as good. I look forward to several re-rides over the course of the next two days. It was nearing 9:15, so we headed for our last ride of the night: The Beast. It was dark, very dark, by this time, and rain was threatening. The ominous skies added to the atmosphere and while we waited about 20 minutes for our ride, no one cared. The anticipation just kept building. We were having that special kind of night where everything seemed transcendental, and even the lines and the people around us were a lot of fun. Again, we sat in the middle of the train, a bit more towards the back than the front. And as we left the station it was pitch dark. I mean, midnight black. We couldn't even read the signs at the top of the lift hill it was so dark. Now, I knew The Beast had a slow lift hill, but man, I had no idea how slow! That thing just does not feel like it is going to make it! And then, just as I was sure we were going to come to a complete stop the train picked up speed only to drop to a crawl just before we crested the peak. There we sat, poised on the brink, slowly making our way over the top of the lift hill to the first drop, surrounded by blackness, and suddenly the Heavens opened up and poured out their wrath upon us in the form of buckets of rain. The timing of this downpour probably will never be repeated. Off we went, racing down the first drop, with the rain beating down and combining with the pitch blackness of the night to create a visual wall that our eyes could not penetrate. We were riding blind! It felt like we were racing towards our inevitable doom. Our screams echoed in the night, echoed in the tunnels, and grew louder as the train continually accelerated, seemingly out of control in the woods. And as our train was thundering through its course, I honestly felt like we were goners. It was the most amazing experience, unlike anything I have ever felt on a coaster before. And, as any Coaster Boy would say, it was totally awesome!!! We returned to the station, drenched but jubilant. And as the rain continued to pour we raced to the park entrance declaring excitedly to any and all who would listen that our ride on The Beast was the greatest coaster experience imaginable. It was like a perfect storm of natural and manmade elements. Just simply a euphoric journey...and the perfect exclamation point on a perfect theme park night. We are now back at the hotel and getting ready for bed. We’ve been on the go since 5 AM and I am exhausted, physically and mentally. While everyone gets cleaned up, I am typing these notes and trying to figure out how in the world I will be able to wake this bunch up at 6:45 AM in time to shower, eat breakfast, and get back to the park in time for Early Ride Time at 9:30. Ah, it will all work out, I am sure. Good night. 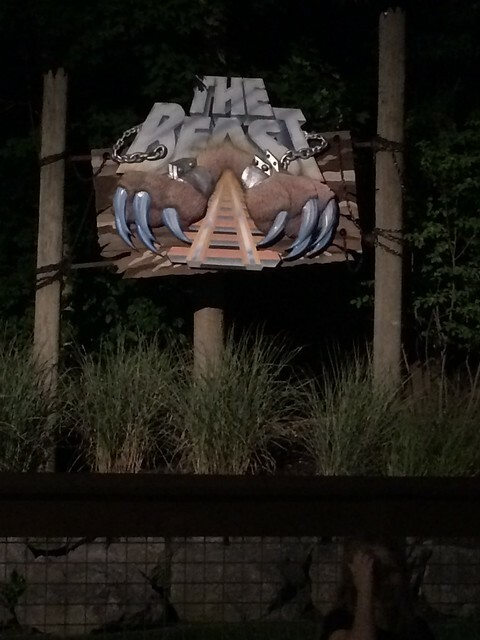 August 27, 2014 at 3:48 AM · The Beast is, by far, my favorite coaster of all time. I'm partial to wooden coasters. August 27, 2014 at 6:29 AM · Wooden coasters are a far better experience than steel coasters when they are properly maintained. It's a shame Cedar Fair has such a shotty spot record with wooden coasters. Anyone remember Ghodtrider pre Cedar Fair? Amazing coaster back then. Glad to see The Beast is still a gem. 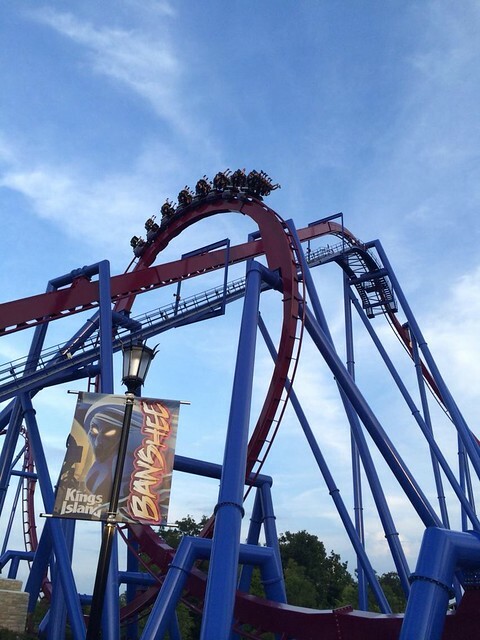 August 27, 2014 at 6:59 AM · We rode Banshee earlier this month and were pretty impressed. I think Montu, Alpengeist, and Afterburn still have it beat, but the design certainly is pretty. I really like the new train design that allows for a little more elbow room, but to me, the new seat mounts seem to transmit a bit more vibration to riders than the previous train design. Also, the inversions are just so big and sweeping that they loose some of that whipping that makes some inverts so incredible. I do love the return of the iconic vertical loop around the lift hill, but the dive loop in lieu of the Immelman didn't really do it for me. The slow roll at the end is the highlight (very similar to the Jojo roll on Hydra). I definitely appreciate Kings Island using that extra crew member to queue guests into rows on the platform. It keeps the line moving, and reduces the chance of empty seats. Every park should consider this on any coaster that maintains lines over 30 minutes to expedite crowds. After all, you have to control the merge between regular guests and Fast Lane/Flash Pass/Fastpass, so why not just have the merge at the load platform and control the flow of guests from there. Six Flags could learn a thing or two from the way Cedar Fair controls loading of their most popular coasters. August 27, 2014 at 7:05 AM · Totally agree with your comments about the Beast and Diamondback...but couldn't disagree more about Banshee. Can't wait to hear the rest of the story! 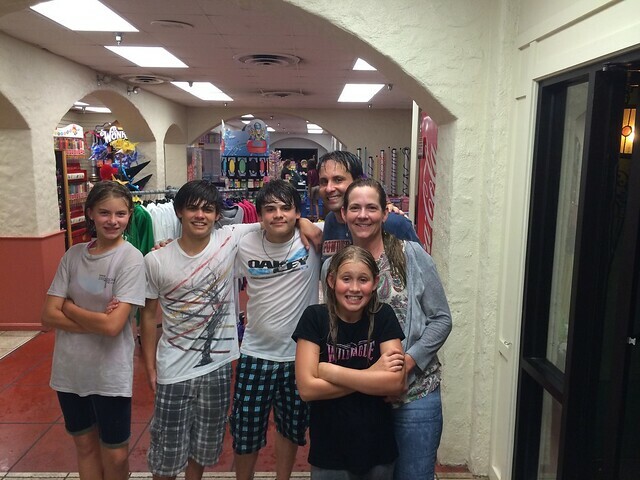 August 27, 2014 at 10:27 AM · My favorite attraction at Kings Island was Banshee, but that experience we had on the Beast, in the dark and in the rain, will probably never be topped. It was fantastic. Russell, I've ridden Alpengeist, and I remember loving it, but it has been awhile. If it is indeed better than Banshee it is by a thin margin at best. And when we are discussing rides of this magnitude and greatness, the only real loser is the person who doesn't take the time to ride! August 27, 2014 at 11:09 AM · Thanks for posting.... Looks like a great time. August 27, 2014 at 11:56 AM · There is a certain magic to nighttime rides on The Beast that just cannot be duplicated. I've had a couple in the pouring rain myself. 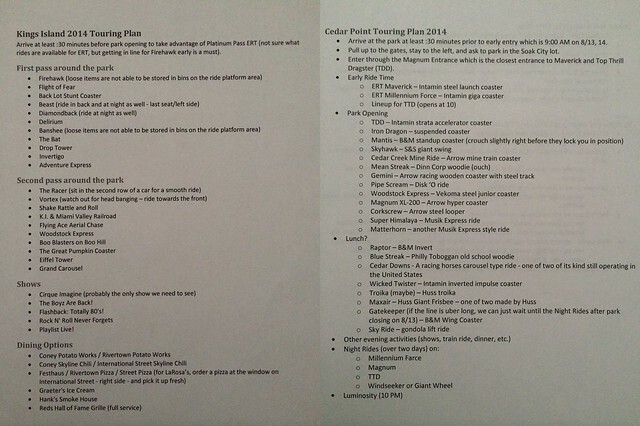 August 27, 2014 at 2:22 PM · This is going to be a great trip report, and I'm particularly interested as I visited both these parks in late July (two days at Cedar Point, one day at Kings Island with ERT). Banshee, Beast, and Diamondback were definitely the best coasters at Kings Island, with Banshee placing in my top 5 steel and Beast in my top 10 wood. I was particularly impressed by the operations at Banshee, as the operators were routinely sending trains out at 45 second intervals, about half of what most B&M Inverts seem to do. That ride on Beast sounded epic. I had an hour of night ERT on the coaster, and I will say that it is probably the second best night ride out there (Boulder Dash beats it). During the day, I still liked the coaster, but there is something about flying through the dark forest that makes the relatively tame ride much more intense. August 27, 2014 at 2:43 PM · Anon poster 184.88.36.35, I can only speak for the rides I took on Banshee (about a dozen of them over the course of our stay) and I never had any issue with the restraints or with the ride itself. I did ride Wild Eagle at Dollywood (a wing coaster) when it first opened and the restraints were very uncomfortable, but those issues did not plague Banshee, at least not for me. August 27, 2014 at 4:15 PM · Cool. We were at Kings Island on August 14th. We do the park once a year, for about 2 hours, on a family trip to ohio. Rode the Banshee twice, loved it. We couldn't get a hotel in Mason because we waited too long, and because they have a big tennis tournament in town that week (which maybe you noticed while you were there). So we stay in Dayton, which isn't a bad ride to the park. My kids got large and hardly fit on anything, so we just rode Banshee, The Bat, and then Beast before leaving. My son also does those two add-ons, the slingshot and skyflyer. KI offers these for $5 each first thing in the morning, which is a fantastic price. If I was there with kids who fit on rides, we'd also do firehawk and diamondback. Not a big fan of the rest of them, although we usually do the mine ride as well. In the past, we've done this in 3 hours starting the half-hour before park opening, and then run up to Cedar Point to do an evening-morning thing before heading back to see my wife and her in-laws. This year we skipped Cedar Point. 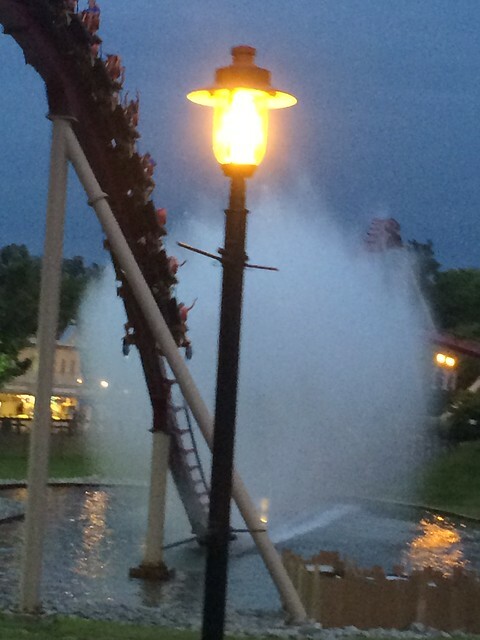 August 28, 2014 at 3:34 AM · Charles, the Rao Family skips the up charge attractions whenever possible, but you're right, Kings Island offers some great deals for those interested in that sort of thing.